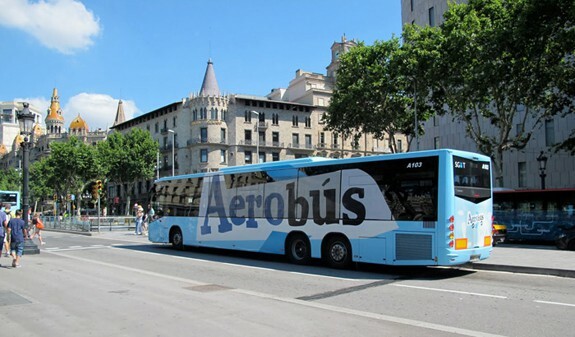 Everything you need to know about using Barcelona’s excellent Aerobus service. We include a map of the route, with locations of all the bus stops, the timetable / schedule, ticket prices and links to the official website for buying advance tickets. There are several ways of getting from Barcelona’s El Prat airport into town, but probably the best one in terms of being affordable, quick and easy is the Aerobus. In fact, 9 times out of 10 it’s the option I choose when I travel. The bus runs 365 days a year, starting at 5:30am until 1am at night and the journey takes just 25 to 35 minutes, leaving you right in the heart of the city in Plaça Catalunya, although you can also alight at Plaça Espanya (another of the city’s major landmarks). You can access the metro easily from both of these squares. Bonus: they also offer free WiFi on board, so you can tweet your arrival before you’ve even gotten to the city centre! Aerobus Route: Where Do I Get On? If you’re arriving at El Prat (this is the ONLY airport in the city… some budget carriers do also fly to nearby Reus and Girona airports), you can catch the Aerobus at either Terminal 1 (T1) or Terminal 2 (T2). There are clearly marked signs outside the arrivals gate at both terminals. Once you get outside, it’s easy to spot the bus stand – just look for the big blue bus with “Aerobus” splashed across the side. Otherwise check these videos. If you land at Terminal 1 you’ll be boarding the A1 Aerobus. If you land at Terminal 2 you’ll be boarding the A2 Aerobus. It takes the same route at the A1, but just with a different starting point. Both the A1 and the A2 routes are the same, and they have four stops on the way to the city centre – Plaça Espanya (1st stop), Gran Via-Urgell (2nd stop), Plaça Universitat (3rd stop) and Plaça Catalunya (4th and final stop). If you’re catching a departing flight, you can get on the bus at any one of three stops – Plaça Catalunya (right in front of the Corte Ingles store, just across the road from the pedestrianised Avinguda del Portal de l’Angel shopping street), Sepulveda-Urgell and Plaça Espanya. If in doubt we advise going to Plaça Catalunya where the stops are easiest to find! There’s nearly always a big blue bus parked and getting ready to go. You can check all of these three stops on a map here. Make sure to check which terminal you’re flying out of, as there are separate buses for T1 and T2. The “A1” bus takes you to Terminal 1 and the “A2” bus takes you to Terminal 2. If in doubt, just ask the bus driver to be sure. If you mistakenly catch the wrong Aerobus, you can transfer between the two terminals at the airport, using a special shuttle bus service, but it will take about 20 minutes. The El Prat airport website has a list of airlines sorted alphabetically, along with information about which terminal they fly from. An airline will only fly in and out of one terminal at El Prat, no matter whether it’s a long or short distance flight. Ryanair, for instance, always flies to and from Terminal 2. Terminal 1: British Airways, Delta, Iberia, United, US Airways, Vueling. Terminal 2: Easyjet, Jet2, Ryanair. Convenient and affordable (photo from Wikipedia). The Aerobus runs between every 5 to 20 minutes all year around (365 days of the year) from early morning til late, with exact frequency depending on the time of day. Both lines have the same schedule every day, even if it’s a Sunday or a holiday. 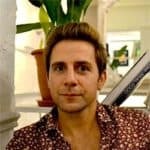 Travel from Plaça Catalunya to the airport takes about 25-35 minutes, but it’s wise to factor in a bit of extra time just in case there’s a lot of traffic that day. For the A1/Terminal 1 line coming from the airport, buses start running at 5:35 a.m. and finish at 1:05 a.m. Between 7:30 a.m. and 10:20 p.m, buses run every 5 minutes. Before and after, they leave every 10 minutes. The A2/Terminal 2 line is slightly less frequent. For the A2 line coming from the airport, the line runs between 6 a.m. and 1 a.m. Buses leave every 10 minutes between 7 a.m. and 11 p.m., and every 20 minute before and after. For the A1/Terminal 1 line going to the airport, buses run from 5 a.m. to 12:30 a.m. Between 6:50 a.m. and 9:45 p.m., there are buses every 5 minutes. Before and after, they depart every 10 minutes. For the A2/Terminal 2 line going to the airport, buses run from 5:30 a.m. to 12:30 a.m. Between 7:05 a.m. and 10:25 p.m., they leave every 10 minutes. Before and after, they depart every 20 minutes. Whilst it’s possible to buy your tickets on the day from the driver, you will need the correct change as they don’t accept bills over €20 (which can be a problem if you’ve only just arrived!). More importantly, as the bus is a popular transport option, there’s normally a queue to get tickets from the driver (or the ticket machine at the bus stop)… however those who already have tickets are fast-tracked by a member of staff straight on board the back of the bus, so it’s a good idea to buy in advance! Once you’ve purchased your tickets via the Aerobus website you can simply print them off and take with you. They’re valid for up to 90 days. Tickets cost €5.90 for a single or €10.20 for a return. The return tickets are valid within 15 days of taking your outbound trip. Children under 4 years of age travel for free. Please note, for the return journey, if you’ve bought a metro or bus travel ticket (like a T-10 or the Hola BCN card), this is NOT valid on the Aerobus. So you do have to purchase them from the official site, as per the link above. All of the Aerobus stops have easy access to the metro, so it’s easy to continue your journey. From Plaça Espanya you can access the Red and Green lines at the corresponding metro station. At Plaça Catalunya you can access the same lines, or you can walk just a 100 metres or so to Urquinaona metro and board the Yellow line of the metro. The Aerobus is suitable for people with reduced mobility. The buses have lots of space designated for luggage storage. There is also an area for things like pushchairs, wheelchairs, bikes, and oversized luggage. During the trip, the bus has a TV channel filled with information about Barcelona. Did we mention free wi-fi? If your flight arrives or leaves outside of the Aerobus’s operating hours, you will need to arrange another type of transportation. The night bus line N16 will take you to T2, and the night bus N17 takes you to T1. Both stop at Ronda Universitat-Plaça Catalunya. You can also take a taxi to/from the airport, which will cost you about €35 to/from the city centre. There may be extra charges for late night trips or for holidays. The taxi journey takes approximately 20-30 minutes. More info on taxis and alternative transport options on this page. Thanks Duncan, this was very useful. Was thinking of taking the metro, but seems the Aerobus is more convenient.